On Saturday 6th July, I went to Liverpool with Jez Hart (BBE/York) to watch the boxing at the Echo Arena. The event, billed as ‘Redemption’ was rather thrilling and I thought I’d share some details with you. 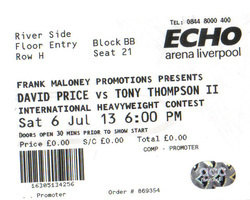 This was my second outing to Liverpool to see David Price fight; last year I watched him demolish Audley Harrison. Jez and I arrived at the venue at around 7pm, collected our tickets and went to find our ringside seats. For Jez, the evening was a business trip because he was sponsoring Neil ‘Perko’ Perkins and was coming to see him in action. For me the evening was a chance for some excitement, a good yarn with Jez and some junk food! Prior to the first bout of our evening (the ring had been busy for an hour prior to our arrival), Jez spotted Frank Maloney (the legendary promoter and a chap that he has known for years) and went to say hello to him. A few moments later, I was beckoned over and the three of us left the ringside and went past security to go ‘back stage’. It turned out we were going to the dressing rooms to meet Neil ‘Perko’ Perkins, the boxer that Jez and his company were supporting. Perko was an amiable Liverpudlian who was grateful for the sponsorship and keen to please. He was actually wearing his BBE baseball cap when we walked in unannounced; and as a marketing man, I was pleased to see him visually embracing his sponsorship. Later he wore that cap to and from the ring too. In the dressing room I kept quiet because Jez was working but I felt honoured to be allowed into the environment - I’ll probably never have that experience again. We returned to the arena and got ready to watch the boxing. We saw four bouts and I’ll write about each one in turn. Before I get going, I was an observer, a generic punter if you like – I am not well versed in boxing parlance so apologies to those that know this subject better than I. This fight was the first I got to watch and the experience was fascinating for me. The bout saw Hamilton defending his Lonsdale British Light Welterweight title for the second time. Both fighters entered the arena with a fanfare of loud music, dry ice and an entourage of team members. Slightly bizarrely, Hamilton was wearing a violet top hat that Willy Wonka would have been proud of! Jez and I turned to each other, he said “Bond Witch Doctor” and I said “Live and let die” – we were clearly on the same wavelength! Baron Samedi would have liked the top hat too! Before the fight started, I had never heard of either pugilist. Before the end of round one, I had everything crossed that Hamilton would prevail. Adil Anwar managed to alienate me in no time at all by showing off and dancing round the ring in some poor impersonation of the great Ali. He didn’t even have his guard up half the time! He had come supported by many from his home town of Leeds and the cacophony was as annoying as his showboating. Conversely, Hamilton focused on the job at hand and got on with it without showing off and looking like an idiot. As Anwar wore himself out by wasting his energy on needless movement, Hamilton stayed tight. At the start of every round, Hamilton was on his feet and in the centre of the ring by the ten second count. I liked his ‘let’s get on with this’ attitude. Anwar’s supporters, some of whom were right behind me, were shouting encouragement all the time; I found myself supporting Hamilton more and more visibly and vocally too. In the end Hamilton’s focus paid off and Anwar started looking more and more bruised as the twelve rounds ground on. Anwar rallied every so often but he was being outclassed and he lost by a wide points margin in the end. I was delighted, which was interesting for me because it’s the first time I have watched a fight without being preoccupied with thoughts about how odd it must be to do a job that involves you thumping someone else. As for Hamilton, he won his belt, he has now successfully defended it twice and if he can do it again, he gets to keep it (the physical belt as opposed the title). I bet that will motivate him next time he is in the ring. The fight was a six round bout that, as I understand it, had initially been scheduled to be a four rounder earlier in the evening. For Jez and I, the fact that it had been moved to later in the running order, had been extended in duration, and was going to be televised was very good news indeed. Not only did we get to see a fight we would have missed otherwise, Jez got to see BBE represented on the gloves of both fighters and a York badge resplendent on Perko’s shorts. The televised coverage of BBE product in a Lonsdale sponsored arena was a nice little ‘points scorer’. Perko was a classy fighter, neat, tidy, precise and unerring. He outclassed Blackwell from beginning to end and will surely go on to much greater things. Frank Maloney has confidence in him too and that’s got to help! During the fight, Maloney was at the ropes and watching Perko closely. When his time in the spotlight was done, Perko nodded to us from the ring - another nice touch! The third bout saw Kevin Satchell the holder of the British & Commonwealth Flyweight titles come up against Iain Butcher, an undefeated contender from Scotland. As soon as the ‘Iceman’ walked towards the ring, I realised that I had seen Satchell fight before. I watched him defeat Chris Edwards in the same ring in 2012! Both fighters looked like kids to me, both weighing in a less than eight stone and both in their early twenties. The 12 round fight began and whilst they looked like children, there was no doubting their experience in the ring. To be fair there was a lot riding on this fight for both protagonists. Butcher, the more compact and proportioned boxer looked dangerous and very nearly caused an upset in round two when he knocked Satchell off his feet. By the end of the resulting count, Satchell was upright again and then had a mountain to climb. To his credit he kept his wits about him and began to go about the job of fixing his lapse in concentration. Having lost round two, he set about winning the bout by technically fighting to a higher standard. Whilst it never looked like he’d knock Butcher over, he landed more punches and more combinations. Butcher was looking for another opportunity to floor Satchell but in doing so just wasn’t hitting him often enough. The bout went the full twelve rounds and the winner wasn’t clear at all, it could have gone either way and nobody sat around me was sure how the judgement would go. In the end Satchell had done enough to get a unanimous verdict but the margin was very close, in fact closer than any other fight of the evening. The Iceman retains his titles! Butcher’s undefeated run ends but my money would be on him having an interesting career ahead of him regardless. This fight was the major event of the evening – the ‘Redemption’ identity coming about because Price had been knocked out in the second round of a match with Thompson earlier in 2013. Price needed to redeem himself after his shock defeat and prove that it was just a blip. This bout was heralded with much pomp and ceremony including drummers from Lee Rigby’s regiment. They were most impressive! Eventually the boxers entered the arena; Thompson came in first with his entourage. Someone in his party was carrying the stars and stripes (Thompson is American) but to all intents and purposes it was just floating down the aisle. As the flag came around to my side of the ring I realised that it was being carried by an adult of diminutive stature. The contrast between Tony ‘the man mountain’ Thompson and this character of restricted height was stark. I warmed to Thompson because he came in to the arena wearing a tee shirt and baseball cap instead of a show-off silk, hooded robe. The audience reception to Thompson was not great but then Price is a scouser and loved by the locals. Thompson looked relaxed and was smiling instead of looking preoccupied or stressed. When Price came in to the arena, one of the tunes he selected was a James Brown number that had Thompson’s primarily black American entourage dancing in the ring. Price entered the arena to more drama and hugely vocal support. Price is certainly an impressive looking fighter, his six foot eight inch frame made Tony Thompson look normal instead of huge. There was much riding on this fight for Price and he looked tense! The bout got underway and round one passed by without incident. In round two though, Price managed to knock Thompson to the deck and at that point the fight could have been over – the crowd went wild with delight. But Thompson to his credit got up dusted himself off, smiled and just carried on. For a man of 41 – that deserves some real respect! In round three, Price came out on a mission to end the bout but in doing so seemed to expend more energy than was wise. Perhaps he had benefitted from a huge adrenaline hit when he knocked down Thompson but it wasn’t long before the ‘high’ was gone and the ‘low’ became obvious. As Price visibly ran out of juice, Thompson stepped up and the tide of the fight started changing. In round five Thompson launched a barrage of blows on Price that ended the fight with the referee stepping in to protect Price. Redemption became ‘repetition’ and Price’s career took a bigger blow than his face had just done! To be fair to Tony Thompson, his record is pretty impressive, 41 fights and only three defeats. His experience is clear – Price with 17 fights and two defeats (both delivered by Tony Thompson) could probably learn something from the older man. Thompson, like Satchell before him, showed that a setback can be overcome with focus and determination. Hopefully Price can rebuild too, perhaps Frank Maloney can help him! Once the Price fight was done, Jez and I headed for the car park – we had two and a half hours of driving ahead of us and it was 11:00pm by that point –and the evening at the Echo continued without us. My second boxing evening was far more exciting that my first – every fight was enthralling and every fighter capable. During the belt bouts and the main show, the tension in the venue was palpable and the spectators were up and down off their seats like yoyos. I have reflected on my desire to see Anwar lose. I wanted to see him taken down a peg or two but I didn’t want to see him actually get hurt. That’s an important differentiation for me. Watching people punch each other for money is odd, but it is easier to watch if the fights are balanced. Watching David Price get pummelled into submission by Thompson was a lot less shocking and upsetting than watching Audley Harrison getting knocked senseless by Price in 2012. Hamilton, Satchell, Butcher and Price were all united in one respect; they all had a lot to lose. Hamilton and Satchell their belts, Butcher his undefeated status and Price his career. And to me, there’s this sobering thought that it doesn’t matter how hard a boxer trains, eventually they will come up against someone that stops them (maybe even twice). Maybe the expression ‘what goes around, comes around’ is more of a truism! Finally, fighting on your birthday is a bad idea – Price and Anwar were both celebrating big days and yet by the end of their respective fights, the celebrations were well and truly over. Thanks go to Jez Hart for his company and hospitality and to Frank Maloney for the VIP ticket.